The cruise started at first light on 7th June with four under sail and two motor cruisers leaving the Solent (one motor yacht taking an unscheduled break on Ryde sands and had to be pulled off) for the trip across the channel to St Vaast la Hougue. Unfortunately, Nota Bene, skippered by Humphrey Cook, had to turn back due to a family illness. The crossing was very pleasant with light winds and some good sailing at times. We all arrived in Saint Vaast at about the same time, apart from our Commodore and her skipper Tim Corner, who arrived at the Lock gate by the skin of their teeth, having decided to sail all the way unaided by their engine. Having all safely arrived and moored up, the crews met up for a meal at the delightful and very welcoming restaurant located directly opposite the marina, called La Criée du Tomahawk. Friday morning was spent exploring the town and at about 12.30 most of the group met and took the bus into Barfleur for the traditional Normandy lunch of Moules Frites washed down with local Normandy cidre. After lunch the group explored Barfleur which is famous for, among other things, the place where William the Conqueror departed to invade England. Friday evening is traditionally when everyone meets on the pontoon for the Commodore’s Champagne and Oyster party and this year was as good as ever with champagne supplied by M. Gosselin and delicious oysters supplied by La Criée du Tomahawk. On Saturday morning members of the group walked into the village to enjoy the regular Saturday morning street market and purchase some delicious French cheese and pâté to take back to the boat for lunch, it is also a good time to visit the wonderful M. Gosselin emporium to stock up on Champagne and wine, to take home. 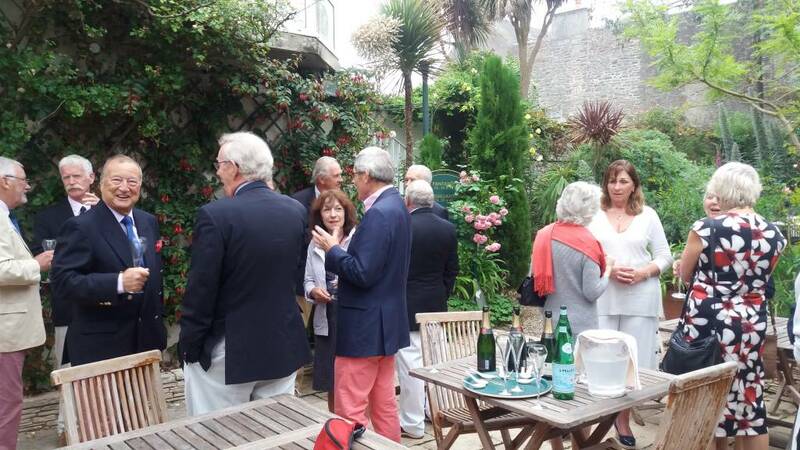 Saturday evening saw the group meet at Les Fuchsias restaurant, for the only semi-formal event of the weekend. As usual the food and service was exceptional and a truly fitting end to a wonderful weekend. Sunday dawned a grey and windy with most having left their moorings by 08.00. The voyage back was pretty bumpy to start, with a good steady wind of 14 – 16 knots however, the wind soon dropped and the sea settled and by the time the fleet were near the shipping lanes the wind was down to 5-6 knots, the sea was like a mill pond and the engine was chugging happily all the way back to the Solent.